It may be a little late, considering the Olympics are almost over, but I thought people might like it anyway. 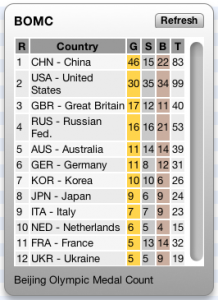 Here is a widget I wrote to display the medal count at the 2008 Beijing Olympics. 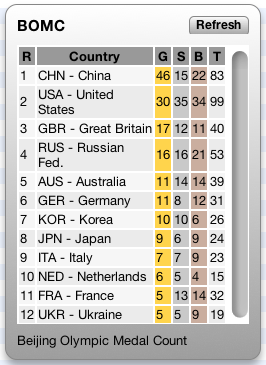 Since there is no RSS feed for on the Olympic site for the medals I had to write code to read values from the html. This entry was posted in Mac and tagged Dashboard, Macintosh, widget. Bookmark the permalink.